Save on your internet and TV along with bundles during these Black Friday and Cyber Monday deals from Verizon Fios. We post the latest deals on this page which in the past have included everything from a $100 gift card to free products included when you sign up for things like their Triple Play or Gigabit internet. You can find all of the deals for 2018 below. $100 Amazon.com gift card, Ring Video Doorbell 2 or Xbox Game Pass for 12 months With Triple Play or Fios Gigabit Purchase – when you sign up for new Fios Triple Play or Fios Gigabit internet service you can get your choice of a $100 Amazon.com gift card, Ring Video Doorbell 2 or Xbox Game Pass for 12 months. This deal is only available for a limited time as supplies last. Amazon Echo Included With New Internet Service – sign up for select internet service plans from Verizon Fios to receive a 2nd generation Amazon Echo at no extra cost. Some exclusions may apply. Amazon Prime For One Year w/ Service – get Amazon Prime included with the purchase of a new Fios Gigabit service from Verizon. You can still be eligible for other promotions and discounts along with this offer. If you already have Amazon Prime then Verizon will credit you the amount of a yearly subscription and pay it for you. We will update this page as we find more deals. The promotions and deals listed were available at the time of publishing. Some deals from Verizon Fios can change depending on your zip code and other factors (check Fios availability). You can find more Verizon Fios deals on our main page. 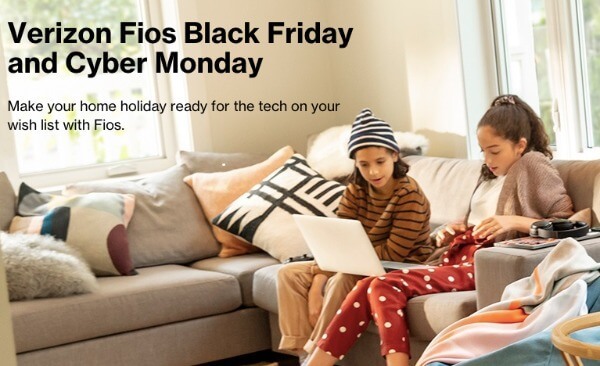 We will continue to post all of the best Black Friday and Cyber Monday deals from Verizon Fios as they become available. Most of the deals start on Thanksgiving Day and then will continue through Black Friday and Cyber Monday. The largest discounts will require some type of new service with most requiring Triple Play or Gigabit Internet.